It is an updated special version of the original book, with lots of new material and examples for hotels and tourism. 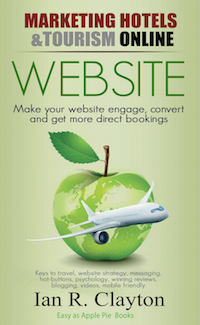 With Twice the material of "Build Your Business Online" (BYBO) the new book on "How to Market Hotels and Tourism" gives you the very latest in online media and marketing strategies: No matter what business you are in. If you already have BYBO, this will take you to the next step in understanding online marketing. And you may be able to get the Kindle version for free. The pre-launch bonuses for this book includes a video series and case studies as well as notification of the "Free Kindle Days" - Limited to first 500 Registered. Book buyers get additional bonuses..